Curtis Drilling, Inc. provides expertly installed well water pumping systems using equipment and components from the most reliable industry leading brands. Once water is available to you in the well, we provide and can upgrade to some of the most efficient means of delivering it to its user. Pumping systems are generally constructed from several major components. The well pump, pressure tank and system controls provide what is needed to have a volume of water available under pressure and a means to sustain that volume. In other words, your well pump keeps the pressure tank full/satisfied and under pressure, while the pressure tank holds the volume available for you at the turn of a faucet handle. 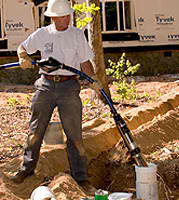 The submersible pump is the heart of the system. There are many brands that also come in many variations as to their output of water in gallons per minute at certain pressures. Our expertise will provide for you the correct pump for its application. The pressure tank is next in this sequence. Again, there are many brands of pressure tanks. (Also called hydro tanks, pneumatic tanks, storage tanks, psi tanks you get the idea). Most all brands make use of plastic or rubber bladder of air inside. While it is perceived this tank holds water ready for use, it does, but there is a much more important reason for its presence. Its true purpose is to create a buffer between the operation of the well pump and the opening and closing of any faucet. Without a pressure tank, every time a faucet is opened for any volume for any duration, the well pump would be required to cut on and off. The constant on/off cycling of the well pump significantly shortens life expectancy. We can assure the correct selection of pressure tank to suit your needs. Last in this list are the system controls. A pressure switch measures the system pressure within your plumbing system. When a faucet is opened, it takes time for the pressure to drop sufficiently to switch the well pump on. Conversely, when the same faucet is closed, the pump will continue to operate until tank refills and increases pressure sufficiently to switch the pump off. What has just been described is Pump Cycle. The longer a pump cycle, the better, from all perspectives. The remaining components of system controls are a self explanatory pressure gauge, a pressure relief valve and a Tank Connection Kit. The tank connection kit efficiently integrates all these system controls together. All the pieces of a well pumping system must operate together to bring water to the faucet. Curtis Drilling is familiar with all variations and the related efficiencies of well pump system controls.